Django Django (pronounced Jango Jango) is the DYI British quartet that has created quite a buzz with their experimental tunes and eclectic self-titled debut record. Already out in the UK, Django Django is due for release in Australia by the end of March. The album has thus far garnered positive reviews and represents the passion of one band who are willing to try it all on their own terms. Music Feeds vicariously sat down (via phone) with drummer, producer and defacto Django Django leader David Maclean to discover you don’t need a drum kit to record drums. 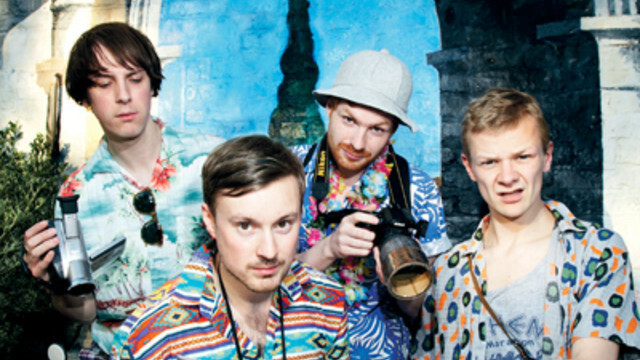 Music Feeds: You’ve been labelled as the defacto leader of Django Django. Does that just mean you do the most amount of work but get the least amount of credit? MF: What’s more exhausting, creating a record or promoting it? DM: I got into music to become a producer and to make music and that’s when I’m happiest – when I’m sitting in the studio and mucking around just recording…that’s where I kind of feel most comfortable and feel like I’m doing what I really want to do. But I guess going out and playing live is such a big thing about being in a band that you have to sort of get your ‘live’ hat on really and get into it… When you’re in the studio you get your ‘studio’ hat on; it’s two quite different things really. For me it’s all about making albums. Making the album and making the music. MF: When compiling adjectives from various interviews, Django Django’s music has been described as ‘exotic psychedelic electronic tribal surf-rock art-pop with coconuts’. Is there a simpler way of describing Django Django’s sound? DM: (Laughter) I don’t know, you tell me. I read all these things as well and I have no idea. To me I’m just making music or the band is just making music. It’s funny to read people coming up with these descriptions, but I have no idea. For a starter, I’m too close to it to know how we are, and the second thing is I just don’t think in term of genres, so I find it hard to pinpoint what we are. I guess it’s up to other people to decide what they think we are. MF: Do you think that trying to limit a band within a certain genre has outlasted its usefulness? DM: No, not necessarily. I think there are bands that are straight up slash metal (or) straight up hip hop. There are guys that just make house music. There are bands that make music that can be definable like that, but then there are a lot of bands that can’t be pigeonholed so easily. And I guess there’s more of those bands around at the moment; bands that defy categorization. I’ve never been one for caring about genres. I’ll buy any record that I like, whether it’s jazz or house or hip hop or grunge or whatever. And I think that’s maybe dictated our music – the fact that we have these eclectic record collections. MF: In a previous interview you’ve stated a fondness of soundtracks, which often play as disjointed but are linked by a common narrative. Did your enjoyment of soundtracks impact upon the overall eclectic sound of Django Django? DM: Yeah, definitely, I mean it’s just another thing that we’re really interested in. Especially when I’m at home I listen to a lot of soundtrack music because I’ve found that music enjoyable to have on in the background… So yeah, it all kind of gets put in there and gets switched on. We watch a lot of films – quite sort of film buffs, so things always end up getting shoved in the mix. And I guess the introduction to the record is quite cinematic and it’s definitely a key influence. MF: Life’s A Beach and Wor both have that surf-rock sound so often associated with Quentin Tarantino films. Is one of your aspirations to one day score a movie? DM: Oh absolutely yeah, that would be brilliant. My brother (John Maclean of The Beta Band) makes them, so maybe down the line he’ll let us score one of his films. That would be a dream for me to score a soundtrack, yeah definitely. Whether it’s our songs getting used in a film, which would be great; but more interesting would be to sit down and actually write a score for a film from scratch. My brother…just won a BAFTA (British Academy of Film and Television Arts) actually, in Britain, for a short film. He’s making a feature film at the moment, so I just have to keep pestering him and dropping hints about getting us to do the soundtrack. MF: I understand that Django Django was mostly made outside the studio. What exactly was the writing and recording process? DM: It was all made in my flat, in my bedroom. Basically Jimmy (Dixon) would come round after work and we would set up a mic and he would play along on the guitar and sing. I would take what he had done and play along with percussion and drums, well not even drum because we didn’t have a drum kit. It was more like using bits and bobs around the flat to make drums. Just trying to pad out and make these songs from what we had, which wasn’t much. It was just good fun doing it, we were never thinking we were going to be a band. It was just a bit of fun after work or after college to have a few beers and write these little songs and record them. When it came to playing the bass, we didn’t have a bass guitar, so we just tuned down the acoustic and then put loads of EQ on it. We didn’t have a drum kit so we’d hit things in the room like the end of the bed or whatever and that would be the drums. We didn’t think about what we were doing other than having fun, and then when people heard, they said keep doing it like that because it sounds good. So we kept on doing it like that and before we knew it we had an album. It was really a record that was made out of necessity… It was about not waiting around to get a studio or waiting around to get any money, it was just about doing it for the hell of it and the fun of it. So we had to use what was at hand really, and I guess that kind of shaped the sound. MF: There’s quite a musical leap between an introspective acoustic song like Hand of Man and an electronic looped track like Zumm Zumm. Is such diversity a result of the different musical tastes from within the band? DM: Yeah definitely, I guess with most of us we don’t tend to listen to albums so much as sort of mix tapes. We’re always making each other mix tapes that might have a massive house record on it and then a Buddy Holly record on it. That’s kind of what we enjoy listening to. So when we made the album, it was just about having different textures and different things going on to keep us interested, really. We made Zumm Zumm and then we were kind of bored of that so we made Hand of Man, which was going to the other side of what we were interested in. MF: When can we expect Django Djando in Australia? DM: Fingers crossed this year, but I can’t promise that, other than I just hope that it does happen. If not this year, then fairly soon, because it seems like they’re having a great reaction to the album over there (Australia) and we’re dying to get over. Hopefully we’ll do a Japan/Australia tour this year.